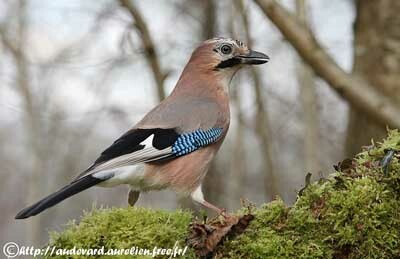 Eurasian Jay is a beautiful Corvidae easy to identify thanks to the bright blue wing patch. 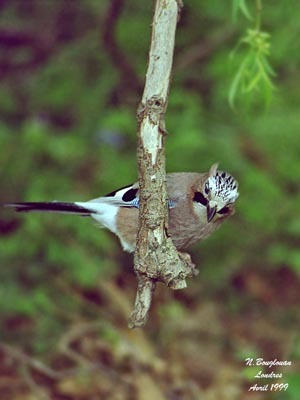 Both adults are similar with pinkish-grey to reddish-brown upperparts. Rump and uppertail coverts are pure white contrasting with black tail. Upperwing shows rufous lesser and median coverts, and bright blue finely barred black primary and outer great coverts. Rest of upperwing shows black to grey-black feathers with white bases or edges, giving a complex wing pattern very conspicuous in flight. Underparts are similar to mantle. Vent and undertail coverts are white. On the head, crown is white streaked black. Forehead, lores, eye’s area, chin and throat are white. We can see a conspicuous black malar stripe. Nape and head sides are similar to upperparts. The strong bill is blackish, with whitish to buffy rictal bristles. Eyes are bluish-white. Legs and feet are pinkish-brown. The juvenile is similar to adults, but with darker body plumage, greyer bill, more bluish eyes and brighter legs. By the first autumn, the young shows irregular black barring on the blue wing patch. We find 34 recognized races sharing the large European range. They differ mainly in intensity of colours in body plumage, in crown and wing patterns and in size. The subspecies G.g. brandtii is also displayed on this card. This race is present in Siberia and northern Japan. The bird has streaked crown, reddish head, grey mantle and darker eyes than nominate. 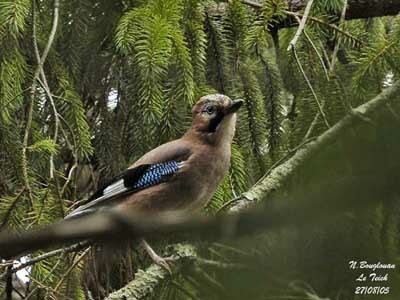 Eurasian Jay’s common call is a loud, raucous screech “skaaak-shraaak” which be often repeated if the bird is threatened. It also gives wide variety of notes often based on mimicry. These notes usually become softer, forming a subdued warbling song. It is able to imitate the Eurasian Buzzard call! 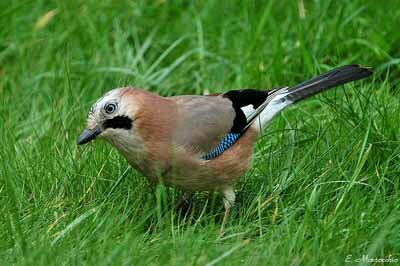 Eurasian Jay frequents all kinds of woodlands and forests, but mainly beech (Fagus), hornbeam (Carpinus) and its preferred oak (Quercus). The birds of the northern parts of the range frequent conifers and birch forests. This species is commonly seen in parks and large gardens and orchards. It may be seen from sea-level up to 4000 metres of elevation according to the range. 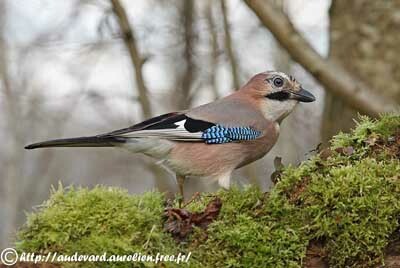 Eurasian Jay is mainly resident from W Europe and NW Africa to E Asia and into SE Asia. It is absent in Iceland. The birds from western and southern parts are sedentary, whereas the eastern and northern populations migrate southwards for food during winter. They sometimes travel in flocks. Some of them also perform altitudinal movements. 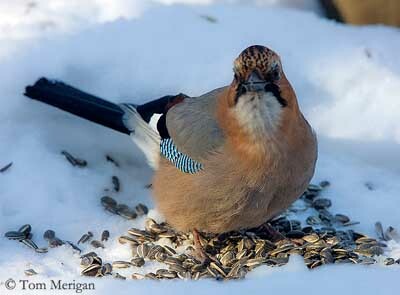 Eurasian Jay feeds primarily on invertebrates such as caterpillars and beetles during the breeding and nesting seasons. It gleans from foliage in trees. But as other Corvidae, it also takes eggs and nestlings of several bird species. During autumn and winter, it feeds on seeds and berries, chestnuts and acorns. 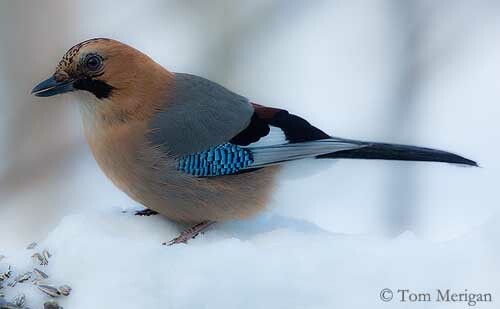 One jay often caches acorns in winter (up to 3000 a month), by burying each acorn in the leaf litter or beneath low vegetation. It has learnt to know the green shoots of oak produced by the buried acorns. The next summer, it easily finds them and feeds the germinated acorn. It is a prolific planter of oaks! 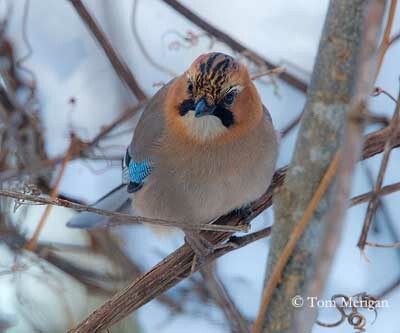 Eurasian Jay is secretive and wary, often heard rather than seen. It remains hidden into the dense foliage, but sometimes we can see it easily in city parks. 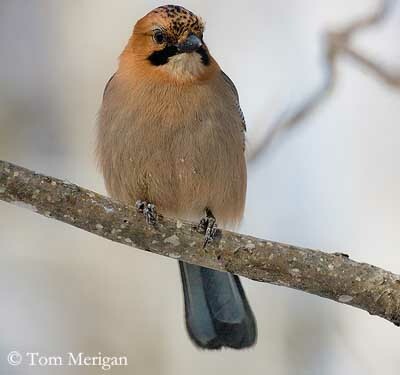 This bird is usually solitary or in small family groups. Several unmated birds often gather in spring to attract a mate. In late summer and autumn, they form large communal roosts. During aggressive displays, the male erects crown and rump feathers. It is territorial during spring and chases away the yearlings from the home range. Outside the breeding season, parents tolerate their young within the territory. During the threat displays, the male approaches with head held up, bill pointed upwards and sleeked plumage. It may perform bill-snapping too. During the fights, the jays grapple each other with feet and peck with the bill. The body feathers are erected, and the semi-opened bill is pointed towards the opponent. Other postures have different functions according to the context, and may be used as well in aggressive behaviour as in courtship displays. Courtship feeding by male to female occurs during laying, incubation or brooding of young at nest, and this is important part of food sources for female. 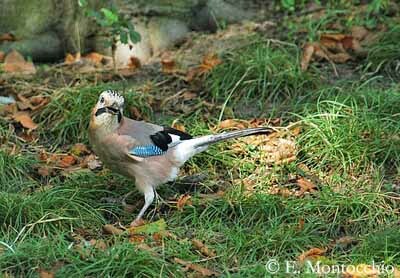 Eurasian Jay performs anting, remaining passive while ants run over its body. After anting, the bird often bathes, then shakes itself and preens. 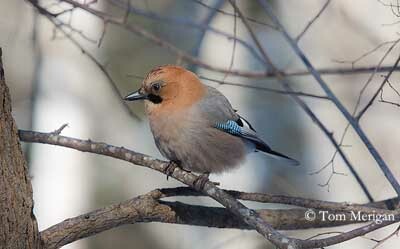 Eurasian Jay usually flies fairly low and between trees. In flight, the white rump is very conspicuous. It performs undulating flight. During migrations or movements in flocks, they climb high and move out with steady wing beats. Both sexes build a well constructed platform of twigs. The cup is fairly deep and lined with softer plant materials. Nest is situated in fork near the centre of the tree or lower crown, concealed by foliage and vegetation, at about 4-6 metres above the ground. Female lays 3-10 eggs and incubates alone during 16-19 days. Chicks are fed by both parents and fledge 19-23 days after hatching. They depend on parents during 7-8 weeks, before to be chased away from the home range. They can breed at one or two years of age. 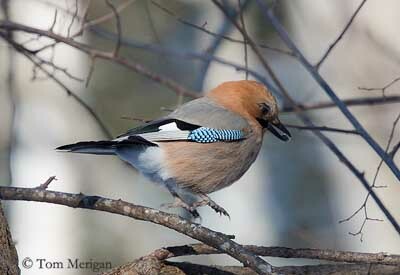 Eurasian Jay feeds on insects during the breeding and nesting seasons. It takes eggs and nestlings of several other bird species. In autumn, it feeds on acorns which excess is buried in soil and dug up when needed. 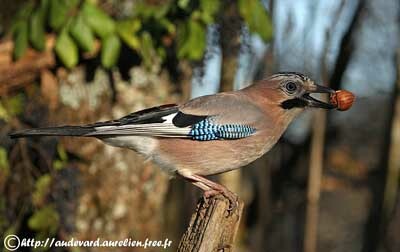 The jay opens acorn by holding it with the feet against the perch and then, it levers bits of shell with the bill. 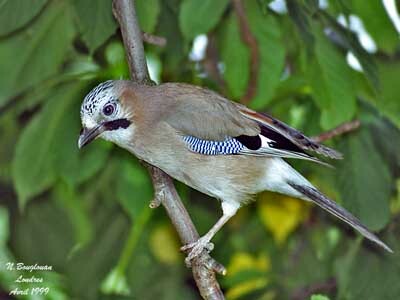 Eurasian Jay is common or locally abundant. They were heavily persecuted in the last century, but today, populations are increasing throughout the most part of the range and are stable. 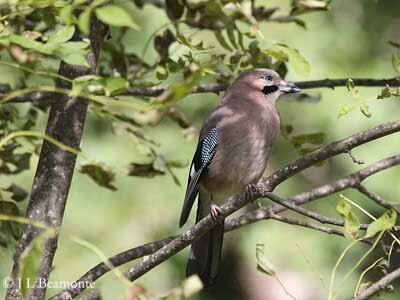 Eurasian Jays have long-term pair-bonds and are solitary nesters.